Way back in February, at the O’Reilly Tools for Change conference, I saw a great presentation by Nina Paley about her feature-length animated film Sita Sings the Blues and her decision to produce it under a Creative Commons Attribution-Share Alike License, which basically means that anybody can “copy, share, publish, archive, show, sell, broadcast, or remix” the film as they wish, as long as they don’t try to pass it off as their own work. She still intended to make money from the film, of course, by selling DVDs and spin-off merchandise, and by booking the film into theaters. Which brings me to the main point: The IFC Center in the West Village has Sita Sings the Blues from Christmas Day to New Year’s Eve, and Paley herself will be at the 8:25 p.m. screening most nights to take questions from the audience. Paley uses something like a half dozen distinct visual styles to tell the mythic story of Sita’s devotion to her husband, Rama, despite his rather dickish treatment of her, with autobiographical fragments from the break-up of her own marriage interspersed. 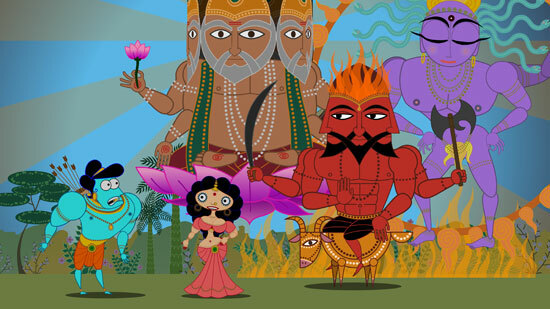 Furthermore, instead of a straight narrative perspective, there’s sideline commentary from three shadow puppets and stunning musical numbers that combine Indian typology, Merrie Melodies-style animation, and the songs of Annette Hanshaw. (Those songs were the main reason the film had trouble finding distribution, as the cost of licensing the recordings for wide theatrical release would be prohibitive.) The result is… well, look, a lot of people try to create a visual poetics of cinema, but Nina Paley succeeds.